1. Macerate dried fruit, zest, tea, and alcohol overnight. 2. Next day, preheat oven to 325 degrees. Spray and line with parchment 2- 8 inch round cake tins and 2- 10 inch round cake tins. 3. Cream butter and sugars in mixer until fluffy. Add eggs one at a time, beating until incorporated. 4. In a separate bowl, sift together flour, pumpkin pie spice, cinnamon, baking powder, baking soda, and salt. Add 1/3 to the butter mixture, mixing on low until just incorporated. Add 1/2 buttermilk, mix until blended. Add next 1/3 flour, mix. Other 1/2 buttermilk, mix. Last 1/3 flour, and mix. Fold in macerated fruit, diced pear, and nuts. Divide evenly amongst prepared pans. Bake for 35-40 minutes or until done in center. Cool completely, spraying occasionally with rum. 5. While baking cake: In a small saucepan, combine all jam filling ingredients and cook on medium until Proper jam consistency when tested. Set aside to cool. 6. To make icing, cube up butter and leave to come to room temp (but slightly more chilled). Heat egg whites with sugar in a metal bowl over a pot of boiling water (double boiler), whisking constantly until mixture reaches 140 degrees F. Place in stand mixer and whip to stiff, fluffy peaks and room temp. Slowly add in butter and flavoring a a little at a time until incorporated. Whip until fluffy. 7. Set aside some white for icing cakes, and color some some for blue border. 8. Layer cakes on proper cardboard rounds, spreading a thin layer of jam in between layers.Spread frosting evenly all around. Chill until firm. Fill second tier with jam and icing, and frost evenly. Chill until icing sets. 10.Melt black white chocolate melts in microwave. Put in piping bag with writing tip. Pipe 6 Eiffel towers. Roll out and cut 8 inch white fondant round for top. 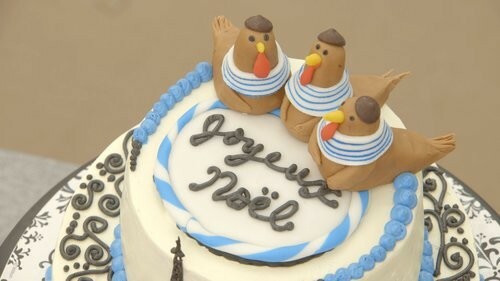 Make the French hens with fondant. 11. Stack cakes w/ bubble tea straws for support. 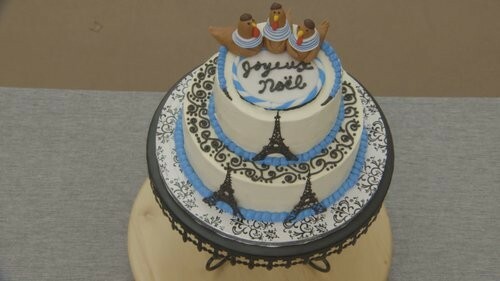 Add fondant on top, pipe words and add hens. Pipe blue borders. 12. After assembling, pipe Joyeux Noel on center. Arrange hens on top. Decorate with hardened Eiffel towers. Pipe additional scroll work and/or fleur de lis.